While a number of evidenced-based articles have been published on restorations for primary anterior teeth, there are few long-term controlled clinical studies offering data on these types of restorations. Treatment recommendations frequently are based on opinion and clinical experience. Given the options for anterior pediatric restorations, an important consideration in today’s practice is concern by a child or parent/caregiver for the esthetic impact of restorative therapy.1–3 It is equally important for practitioners to be well-versed in the clinical indications — and advantages and disadvantages — of various anterior restorative options for this patient demographic. Caries risk assessment (CRA) and patient age are important factors in treatment planning. Patients with a low CRA who present with small incipient (noncavitated) lesions can be successfully managed with noninvasive preventive modalities. Topical fluoride application — such as fluoride varnish or use of fluoridated toothpaste — is a key part of preventive therapy.10 By comparison, pediatric patients with high CRA will require more extensive treatment. A key management consideration is the patient’s age and timing of exfoliation of the primary tooth and eruption of the permanent tooth, as these factors will influence decisions regarding the need for restoration. Cavitated lesions classified as Class V (facial), Class III (interproximal) or Class VI (incisal) lesions on primary teeth usually present few challenges in treatment. Palatal or lingual Class V lesions can frequently present access and isolation issues in this population, especially with mandibular lesions. One factor that does not have to considered in choosing a material for Class V restorations is occlusal wear, as stress from occlusal forces is not a concern. Successful treatment for Class V and Class VI lesions can be accomplished using a number of restorative materials, such as resin-based composite, glass ionomer (GI), resin-modified glass ionomer (RMGI), nano-ionomer restorative cement, and bioactive restorative material.8,9,11 Each has its benefits and limitations. When finished, composites can be highly polished and be quite esthetic in appearance. On the other hand, GI, RMGI and nano-ionomer restorative cement offer fluoride release and recharge that benefit high-caries-risk patients; in general, however, their esthetic properties do not match composite materials. Class III and Class IV anterior lesions can inherently present issues and limitations, including concerns over retention and possible pulpal involvement. As previously noted, the pulp chamber is disproportionally larger in anterior primary teeth, and this is one reason why successful restoration can be technique sensitive and challenging. While a number of techniques have been introduced to aid retention, one popular approach is the use of a dovetail (usually placed on the palatal or lingual aspect of the tooth and, in some cases, on the labial surface). Another common technique used in place of a celluloid strip is trimming a strip crown in half (labial to palatal). Using the half-crown as a matrix, the provider places the restorative material in the crown and light cures. As detailed in Table 1 and Table 2, choices in full-coverage indirect pediatric restorations include stainless steel crowns (SSC), SSCs with preveneered facing, strip crowns, and zirconia crowns. (Only zirconia crowns are offered for lower anterior teeth.) Flex Crowns, Life Like Crowns and Pedo Jackets (available from SML, Chatsworth, Calif.) are additional options for full-coverage crowns.8,12 For other crowns, use of the contralateral maxillary lateral crown will allow for treatment of the central and lateral mandibular incisors. Full-coverage esthetic crowns can be classified in two categories: those that are preformed and cemented to the tooth with luting agents (e.g., SSCs, preveneered crowns, Flex Crowns and zirconia crowns). The second category includes crowns that are bonded to tooth (e.g., strip crowns, Life Like Crowns and Pedo Jackets). Each type of full-coverage crown has its benefits and limitations. Another option is an SSC with an esthetic, prefabricated labial veneer. Preparation is similar to SSCs; in some cases, additional reduction of both labial and palatal surfaces is necessary to allow for the labial veneer. Cementation is with luting cement. Crimping of the crown is usually not recommended due to the possibility of dislodging the veneer. Preveneered SSC advantages: Good esthetics; not technique sensitive; and fabrication and placement are not overly time consuming. Strip crown advantages: Highly esthetic; fabrication and placement usually require no local anesthesia. Strip crown disadvantages: Technique sensitive with lengthy treatment time; long-term durability issues; proper retention relies on adequate tooth structure; contraindicated for patients with extensive deep bites or anterior crossbites. Zirconia crowns are variation of cubic zirconia and offer excellent esthetics, with fewer restrictions or concerns of other full-coverage restorations. Unlike SSCs with preveneered facings (that can dislodge or fracture), zirconia crowns are not prone to fracture. Compared to other restorative options, however, more extensive preparation is usually required. Adjustment is performed on the tooth, not the crown, as the crown cannot be adjusted to ensure proper fit.8,16 Preparation requires labial reduction of approximately 1.5 to 2 mm, as well as labial palatal and proximal reduction of approximately 1 mm. Additionally, an approximate 1 mm circumferential subgingival featheredge reduction is necessary. Cementation is with GI, RMGI or bioactive cement. Adequate isolation of the tooth prior to final cementation is an important factor, as contamination from oral fluids, including blood, can adversely impact retention of zirconia crowns. Some manufacturers include internal modifications to enhance retention. For example, Cheng Crowns (Peter Cheng Orthodontic Laboratories, Exton, Pa.) utilize a crimp lock retentive design. EZ Crowns (Sprig USA, Loomis, Calif.) uses Zir Lock Ultra Grooves to aid retention, while Kinder Krowns (Mayclin Dental Studios, St. Louis Park, Minn.) feature internal retention bands. NuSmile (Houston, Texas) recommends cementation utilizing bioactive cement. Research has shown one advantage of using bioactive cement is that it releases fluoride, calcium and phosphate to aid hydroxyapatite formation.17 An important consideration for long-term retention is that the internal surface of the crown be free of all moisture, saliva or blood during placement. One company, NuSmile, offers try-in crowns, which, except for their pink color, are the same as the firm’s zirconia crowns. As the name suggests, these are used to determine proper crown fit. Once used, these try-in crowns can be cleaned and sterilized prior to reuse. A key benefit is that try-in crowns allow for an uncontaminated final zirconia crown to be cemented in place. 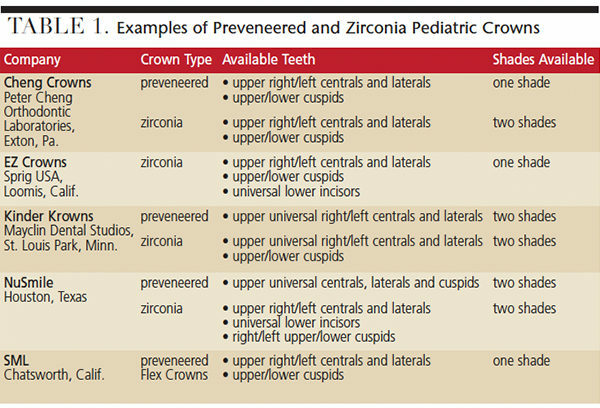 Zirconia crown advantages: Zirconia crowns are the only pediatric full-coverage restoration that offers sizes to accommodate lower anterior teeth; monolithic zirconia is biocompatible, highly esthetic and can be autoclaved if contaminated; fabrication and placement are not overly time-consuming. As noted at the outset, while a number of evidenced-based articles have discussed restorations for primary anterior teeth, there are few long-term controlled clinical studies offering data on these types of restorations. Thus, it is important for dentists to be well-versed in the clinical indications of various anterior restorative options for this patient population. It is important for providers to be well-versed in the clinical advantages and disadvantages of various anterior restorative options for the primary dentition. With respect to retention and potential pulpal involvement, the anatomic aspects of primary teeth directly impact restorative decisions. Soares FC, Cardoso M, Bolan M. Altered esthetics in primary central incisors: the child’s perception. Pediatr Dent. 2015;37:29–34. Sharat CP, Abdulrahman AS, Sultan A, Fares BS, AlBara A, Mohammad A. Esthetic concerns and acceptability of treatment modalities in primary teeth: A comparison between children and their parents. Int J Dent. 2016;2:1–5. Liu, JA, Donly KJ. A review of esthetic crowns for the primary anterior dentition. Decisions in Dentistry. 2016;2(10):18,21–25. Dental Growth and Development. Available at: aapd.org/media/Policies_Guidelines/R_DentalGrowth.pdf. Accessed April 26, 2018. Dye BA, Hsu KL, Afful J. Prevalence and measurement of dental caries in young children. Pediatr Dent. 2015;37:200–216. Nelson SJ. Wheeler’s Dental Anatomy, Physiology and Occlusion. 10th ed. St Louis: Elsevier Saunders; 2015. Behavior Guidance for the Pediatric Dental Patient. Available at: aapd.org/media/Policies_Guidelines/BP_BehavGuide.pdf. Accessed April 26, 2018. Waggoner WF. Restoring primary anterior teeth: updated for 2014. Pediatr Dent. 2015;37:163–170. Pediatric Restorative Dentistry. Available at: aapd.org/media/Policies_Guidelines/BP_RestorativeDent.pdf. Accessed April 26, 2018. Pitts NB, Ismail AI, Martignon S, et al. ICCMS Guide for Practitioners and Educators. Available at: iccmsweb.com/uploads/asset/592845add7ac8756944059.pdf. Accessed April 26, 2018. Berg JH, Croll TP. Glass ionomer restorative cement systems: an update. Pediatr Dent. 2015;37:116–124. Waggoner WF. Anterior crowns for primary anterior teeth: An evidence based assessment of the literature. Eur Arch Paediatr Dent. 2006;7:53–57. Lee JK. Restoration of primary anterior teeth: Review of the literature. Pediatr Dent. 2002;24:506–510. MacLean J, Champagne C, Waggoner W, Ditmyer M, Casamassimo P. Clinical outcomes for primary anterior teeth treated with preveneered stainless steel crowns. Pediatr Dent. 2007;29:377–382. Ram D, Fuks AB. Clinical performance of resin-bonded composite strip crowns in primary incisors: A retrospective study. Int J Paediatr Dent. 2006;16:49–54. Prabhakar AR, Chakraborty A, Nadig B, Yavagal C. Finite element stress analysis of restored primary teeth: A comparative evaluation between stainless steel crowns and preformed zirconia crowns. Int J Oral Health Sci. 2017;7:10–15. NuSmile. NuSmile BioCem technical support. Available at: nusmilecrowns.com/BioCem/Technical-Support. Accessed April 26, 2018. Clark L, Wells MH, Harris EF, Lou J. Comparison of amount of primary tooth reduction required for anterior and posterior zirconia and stainless steel crowns. Pediatr Dent. 2016;38:42–46. Walia T, Salami AA, Bashiri R, Hamoodi OM, Rashid F. A randomised controlled trial of three aesthetic full-coronal restorations in primary maxillary teeth. Eur J Paediatr Dent. 2014;15:113–118. From Decisions in Dentistry. June 2018;4(6):22–25. Steven P. Hackmyer, DDS, practices pediatric dentistry in Tucson, Arizona. He previously held academic positions, including serving as chair of the Department of Pediatric Dentistry and Community Oral Health at the University of Tennessee Health Science Center in Memphis. Hackmyer is a diplomate of the American Board of Pediatric Dentistry and a fellow of the American College of Dentists and International College of Dentists. He can be reached at sphdds@gmail.com.